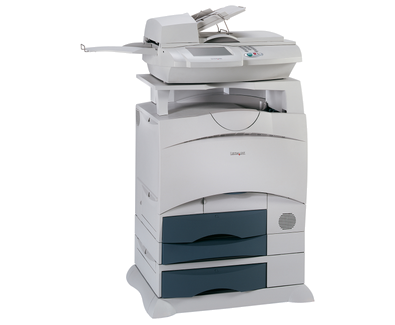 The Lexmark X752e MFP uses the Lexmark e-Task colour, customizable touch screen interface bringing simplicity and industry-specific tailored solutions to enterprise customers, and when used with the Lexmark Document Solutions Suite software offers flexible solutions for electronic forms creation and merge, document capture and electronic distribution, and on-demand document retrieval and printing. True 1200 x 1200 dpi and 2400 Image Quality provide vibrant colour prints and business graphics using new colour toners in new cartridges. Time to first colour print of less than 17.5 seconds allows users to get short jobs in a hurry and the 600 MHz RISC processor with 256MB of RAM quickly processes large complex colour jobs. Labels, Card Stock, Plain Paper, Transparencies, Envelopes, Refer to the Card Stock & Label Guide.